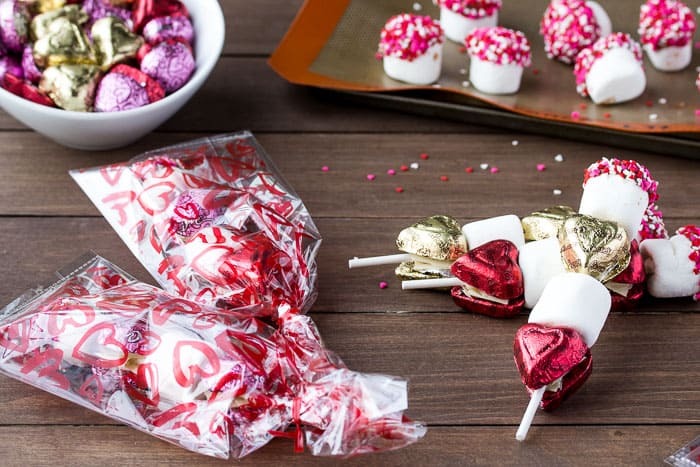 Valentine’s Day Candy Kabobs are fun homemade Valentine’s gifts! Follow this easy tutorial with your kids to make fun treats for family, friends, teachers, and loved ones! When it comes to the annual school Valentine’s Day party, my son and I usually end up buying a cheap box of Valentine’s Day cards with whatever his favorite character is at the time all over them. But as he gets older, we agreed that he wanted to do something more fun and creative. We decided that homemade Valentine’s treats would be a little more special and definitely the way to go. 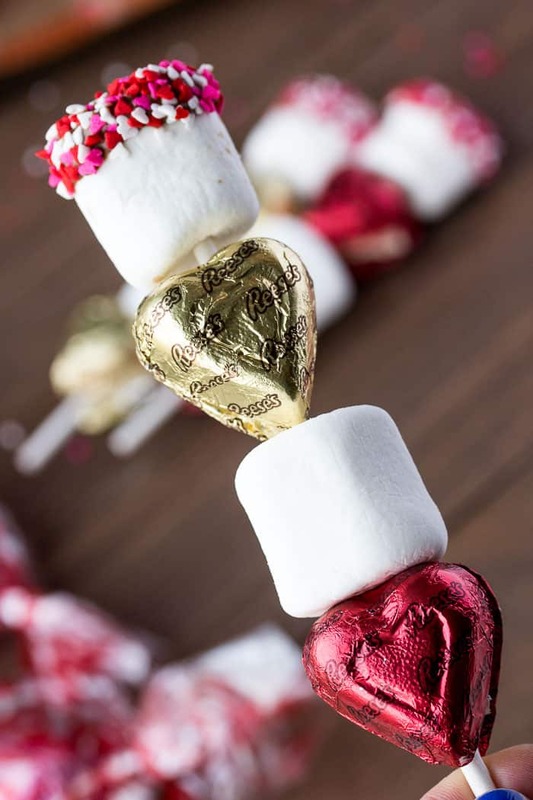 These Valentine’s Day Candy Kabobs are easiest to make for a few friends or family members, but you can easily multiply the supplies needed to make them for your child’s entire class. 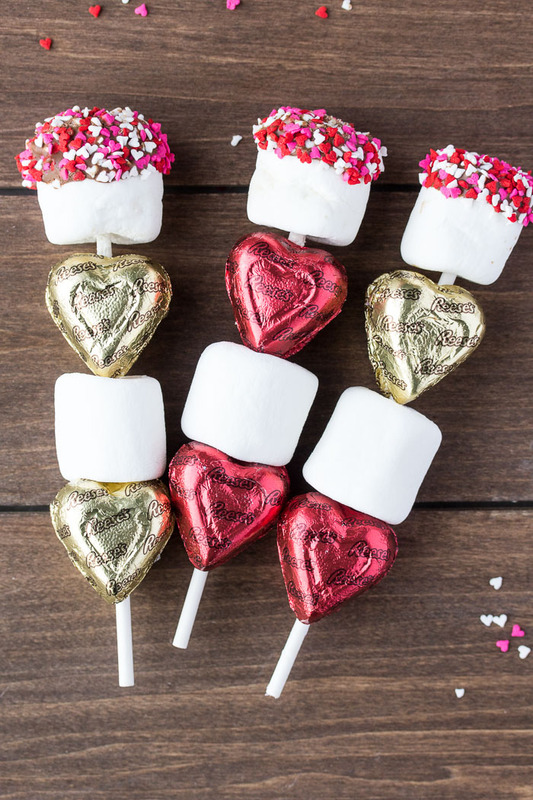 Not only are they fun (and maybe a bit messy) to make with your kids, but homemade gifts are truly the best gifts. And, getting to spend more time with your kids is always priceless! 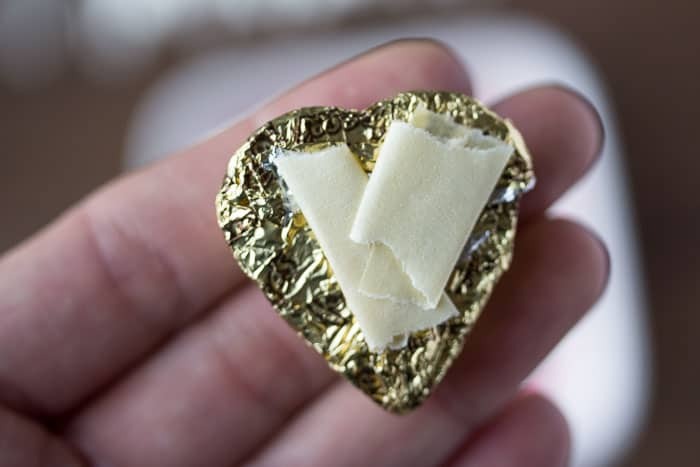 Melt the chocolate in a microwave safe bowl for 1 minute at 50% power. Stir. If not completely melted, continue to microwave in 15-second increments until melted. 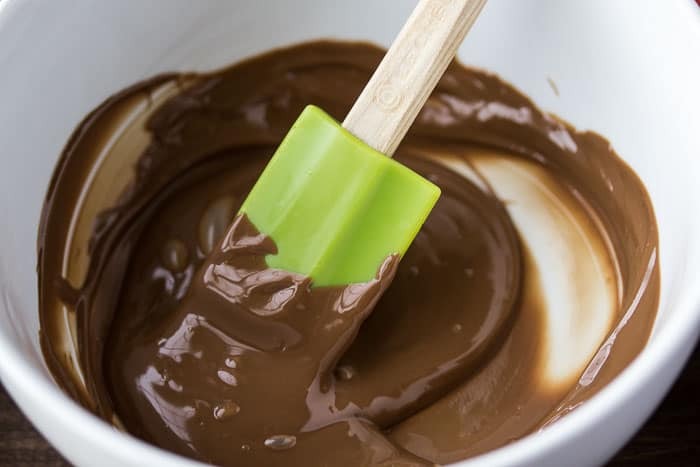 Dip the ends of a marshmallow in the melted chocolate, about 1/3 of the way, letting any excess chocolate drip off. Then, roll the chocolate covered end into the sprinkles. Place on a Silpat mat or foil-lined baking sheet. Repeat this with 9 more marshmallows, then place the tray in the refrigerator or freezer for a few minutes to speed up the time it takes for the chocolate to set. Meanwhile, add small rolled up pieces of tape to the backs of the 40 candies. You want the tape to stick up some. I ended up using about 3 pieces of tape for each piece of candy. I would not recommend using glue, as it may run off onto the marshmallows. Stick one candy near the bottom of a lollipop stick, leaving about an inch to hold onto. 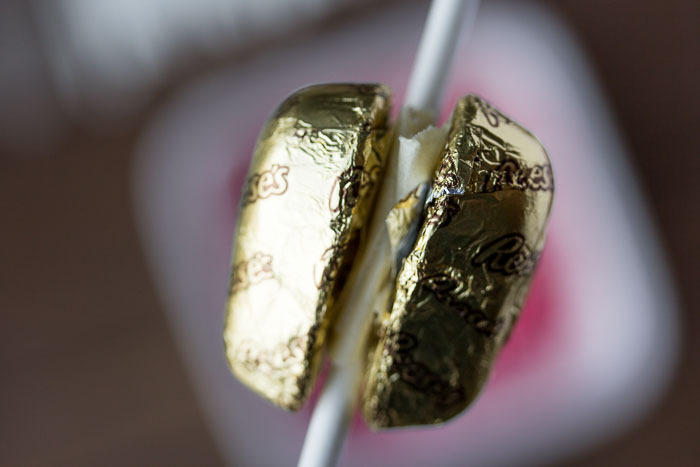 Place another candy opposite of the first, and press them together so that the tape sticks to the lollipop stick and the opposite candy. Slide a plain marshmallow onto the stick next. Don’t worry about any marshmallow that sticks to the stick. If you try to wipe it off, you’ll just end up with a bigger mess. 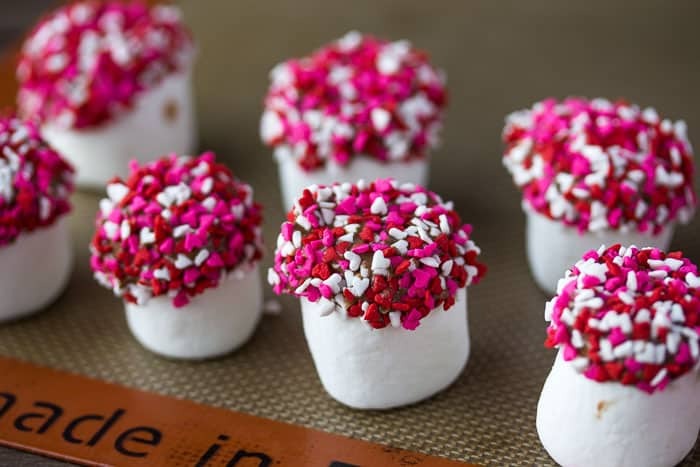 Add another set of candies above the marshmallow and top with a candy coated marshmallow (once the chocolate is fully set). Place one kabob in each gift bag and secure with a tie or ribbon. Multiply the supplies as needed to make treats for an entire class. 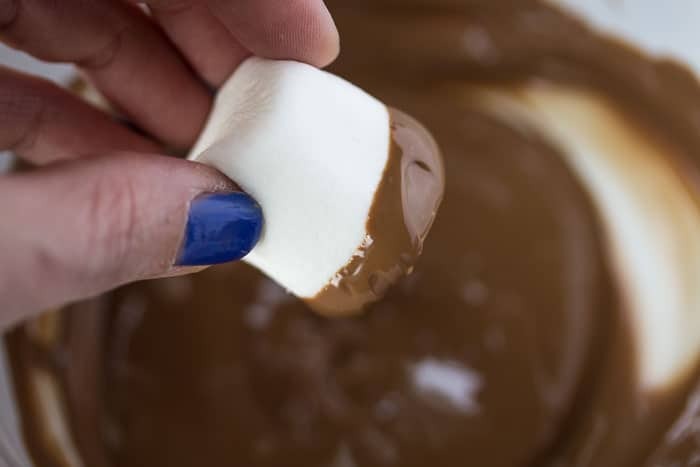 Use extra chocolate candy to melt for the marshmallows. If you don’t have extra candies, you can use chocolate chips. Store your candy kabobs in the refrigerator to prevent them from melting before you gift them. 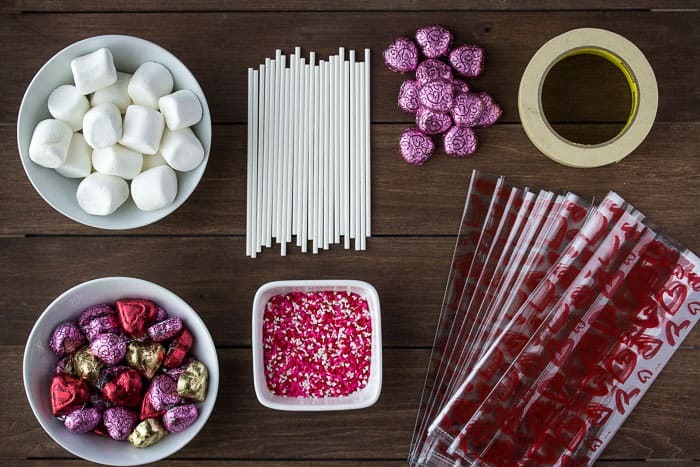 Enjoy this tutorial for how to make Valentine’s Day Candy Kabobs? Follow me on Pinterest, Instagram, and Facebook for more! This tutorial was originally published on January 25, 2018. The text was updated to include more thorough directions as well as tips and techniques in February 2019. Always read and often try your delicious recipes. Today I was looking for a homemade gift to give a friend who just came home from hospital. The valentine arrangement with marshmallows and chocolates hearts look interesting! Thanks so much for stopping by to let me know Earlyne 🙂 I hope your friend is doing well – I’m sure she will really appreciate a homemade gift! They really are the best!